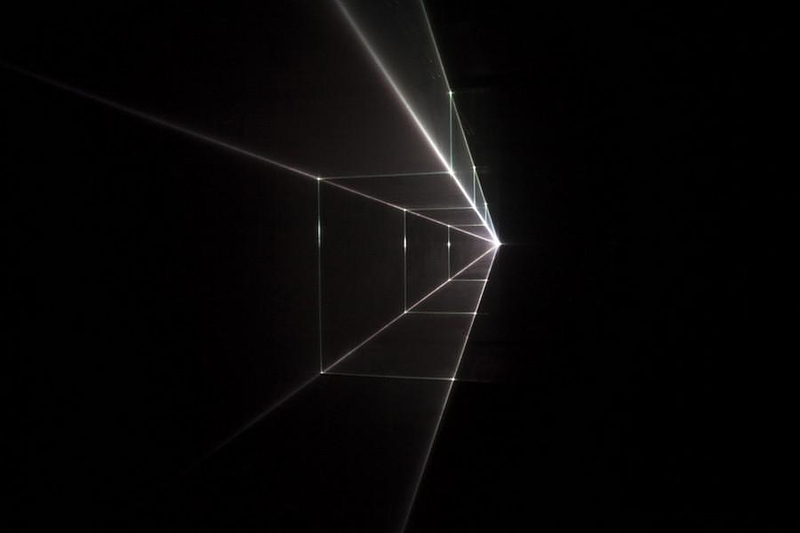 Vanishing Point - renaissance perspective drawing with lasers by UVA. 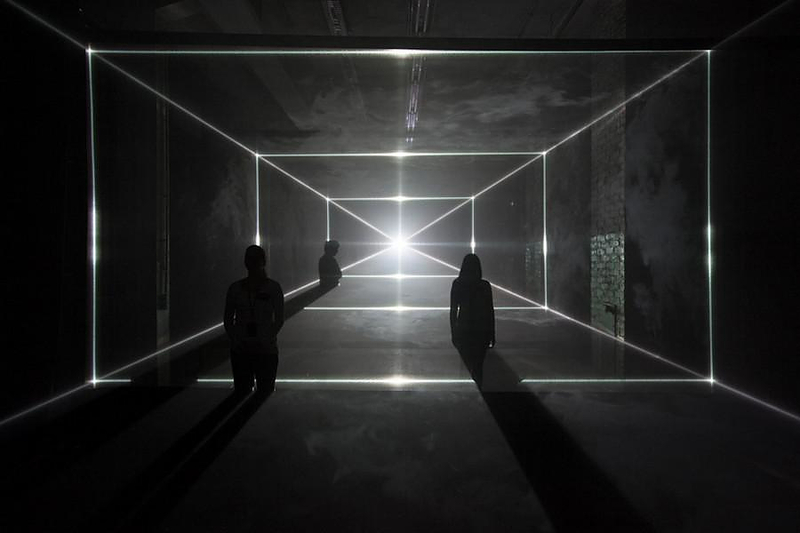 HomeBlogArchitectureVanishing Point – Renaissance Perspective Drawing with Lasers by United Visual Artists. 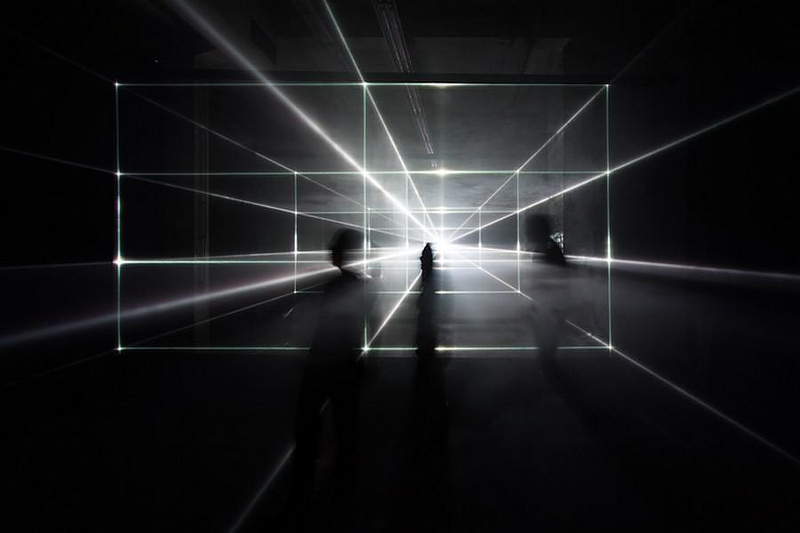 London based UVA (United Visual Artists) use architectural design and laser beams to create an impressive light installation, where the past meets the future. 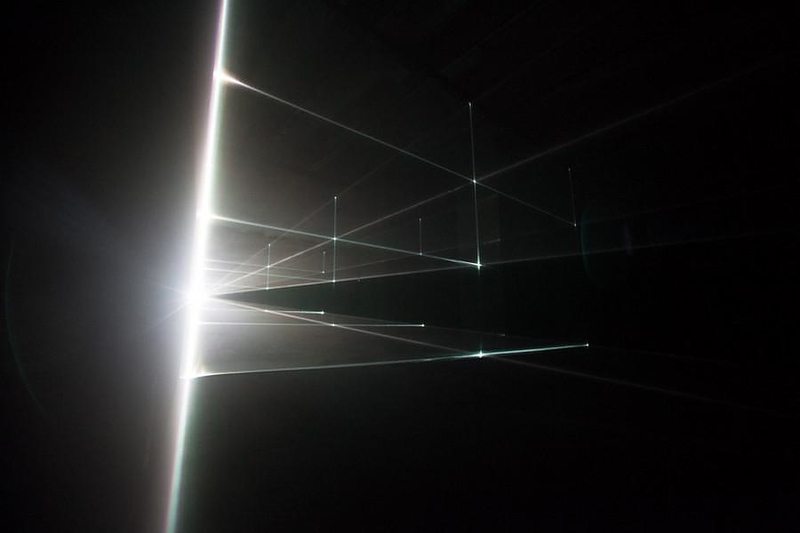 Vanishing Point employs perspective as both tool and visual outcome to reshape, redefine and represent a space. 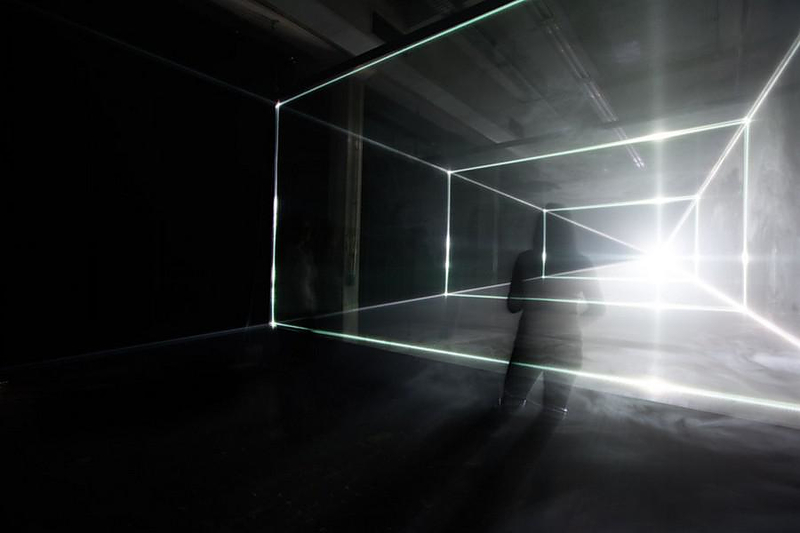 Inspired by sketches of Leon Battista Alberti, Leonardo DaVinci and Albrecht Dürer, UVA sends lines into space from an arbitrary vanishing point, creating different volumes, divisions and rooms to be explored by the audience. During the Renaissance artists wanted to elevate the art of painting and raise it to the standards of senior arts. The only way to do this in the context of humanistic approach was to bring painting closer to what we now call science and in this case closer to mathematics and geometry. In order to do that they had to adopt new principles or “rules” of painting and suggest a theory around it. That way painting would meet the standards of other forms of art, such as sculpting and architecture. Driven by this historical journey of painting UVA brings the centuries- old project into present time. In order to make painting “scientific”, Renaissance painters had to use a “systematic method” that would help even the most mediocre painter improve his work and present his painting approach in a concise manner. This system was none other than “linear perspective”, a system of perspective usually considered to have begun around the fifth century BC. in the art of Ancient Greece. 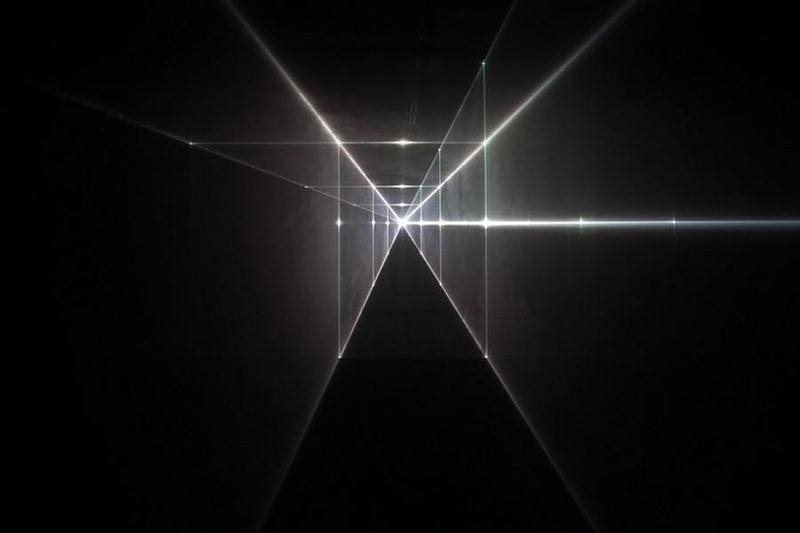 Linear perspective is based on the principles of geometry, the artist had to set a starting point for all the axes of the composition. This point, stereotypically, was approximately in the center of the canvas and was called, vanishing point. A one-point perspective drawing means that the drawing has a single vanishing point, usually (though not necessarily) directly opposite the viewer’s eye and usually (though not necessarily) on the horizon line. All lines parallel with the viewer’s line of sight recede to the horizon towards this vanishing point. This is the standard “receding railroad tracks” phenomenon. A two-point drawing would have lines parallel to two different angles. Any number of vanishing points are possible in a drawing, one for each set of parallel lines that are at an angle relative to the plane of the drawing.The axes served as a hidden blueprint and the distances between them indicated the correct position of the figures or other elements of the painting, as well as their scale. Everything seemed right. The painting as illusion, as a representation of visual reality was true. Inspired by this effort of Renaissance era painters to elevate their art, but also by their need to rely on something more concrete and recognizable, such as architecture, UVA creates entire 3D perspective environments out of light. 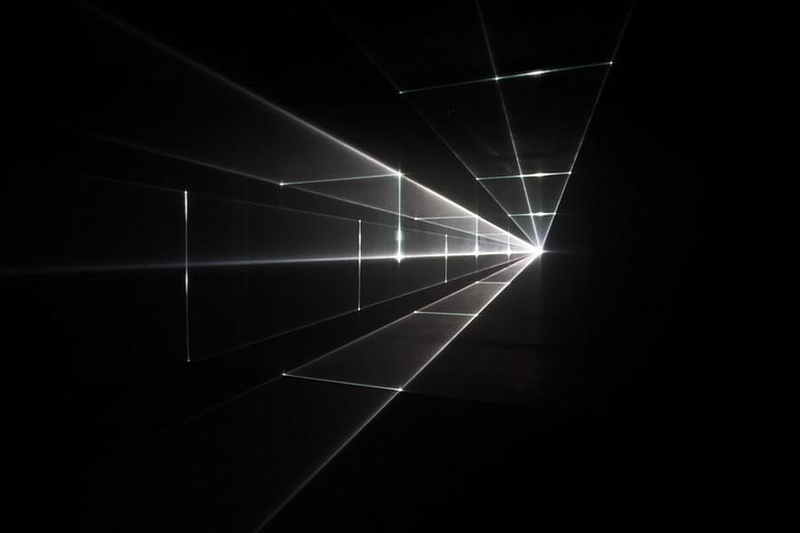 The London based artists use the rules of perspective to create immersive architectural spaces defined by shooting beams of white light. The goal, more or less, remains the same, the presentation. The means are those that change. 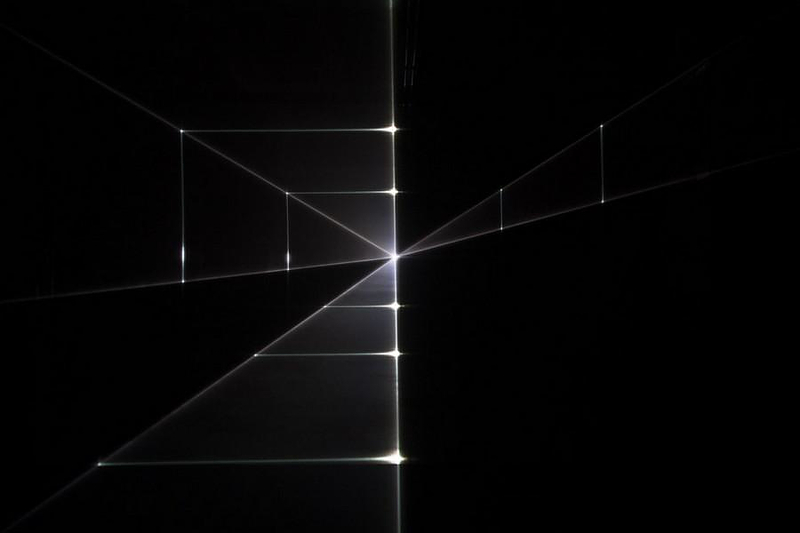 In place of the two-dimensional canvas, UVA used three-dimensional space and pencil lines are replaced with laser beams. If a Renaissance painting was “a window to the world” for UVA it is a room, a space that provides a peak into the future. 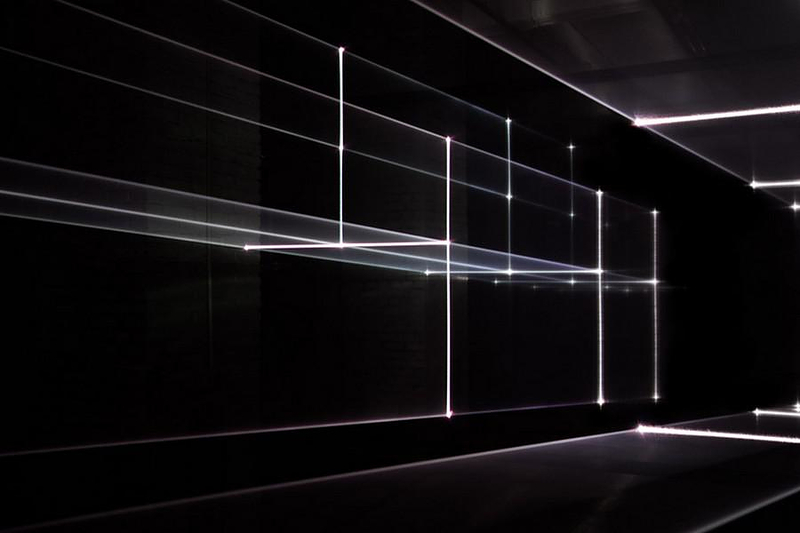 They use lasers to recreate the architectural drawings and introduce the viewer in a three dimensional world. 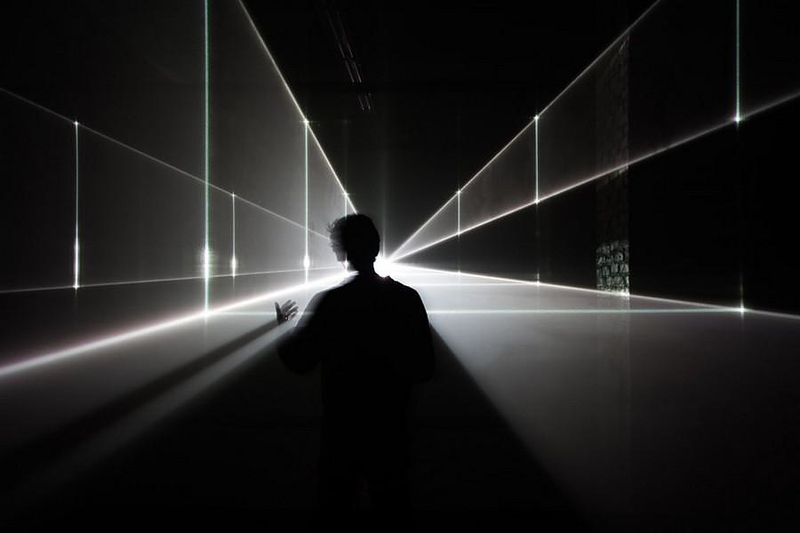 The spectator-visitor becomes the center of the project, he sets the scale, he defines the movement and the interaction in it. 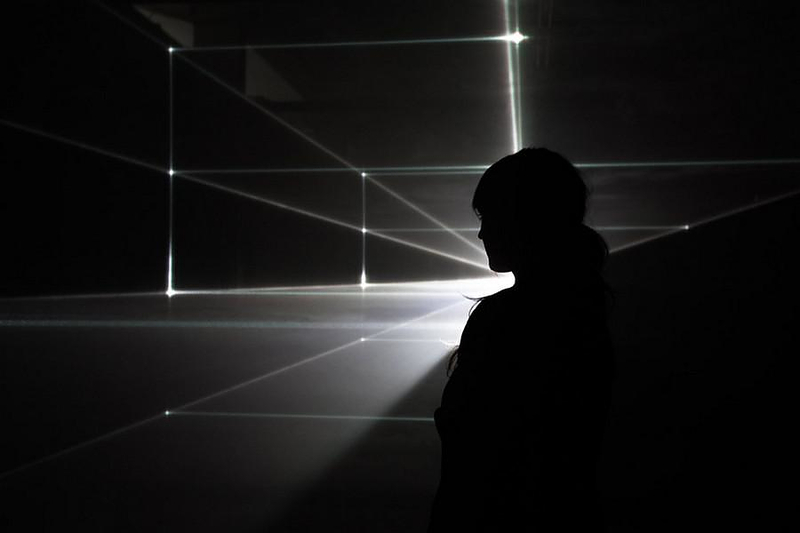 The viewer is the one who breaks the stagnation of the outlines, the one that gives life to the project. 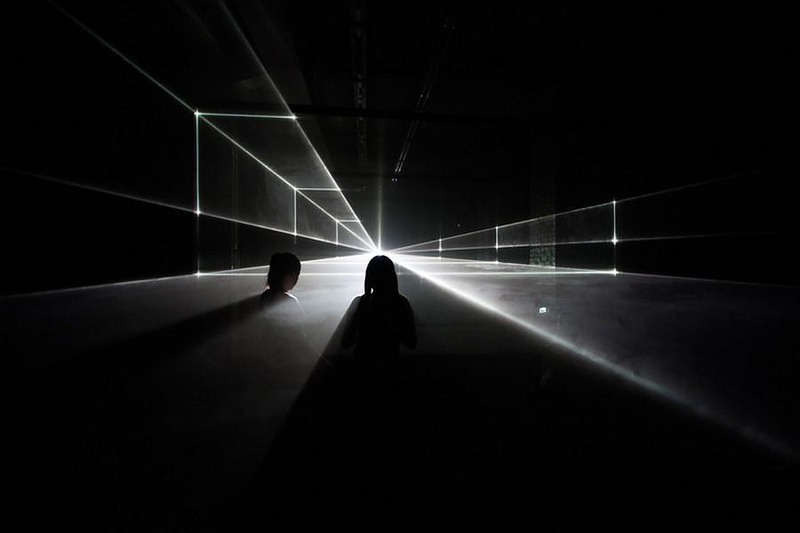 Laser beams define the boundaries and the space is transformed into an unstoppable play of light and shadow, a futuristic spectacle. 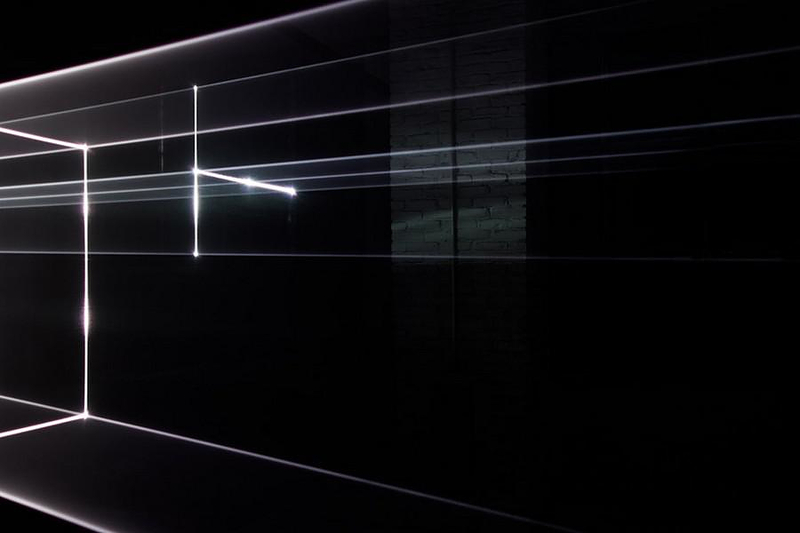 Vanishing Point is currently on display at the “Olympus Photography Playground” in Berlin until 2nd of June. 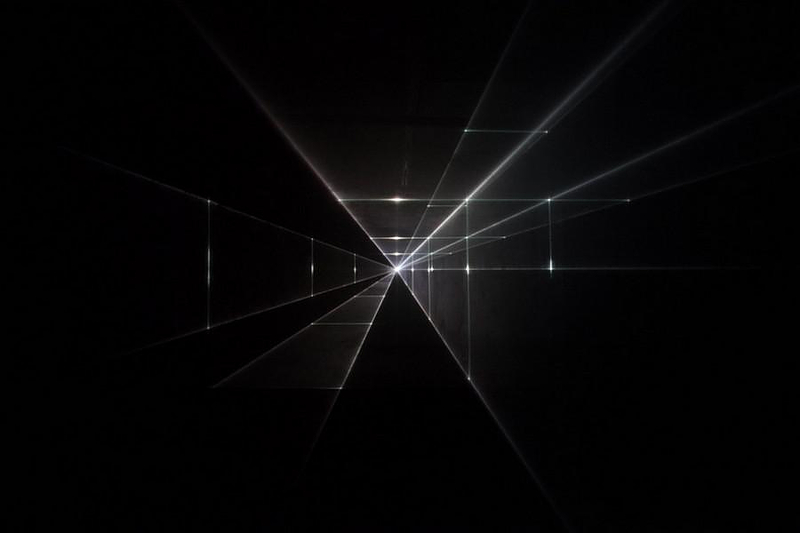 United Visual Artists (UVA) are an art and design practice based in London, creating work that lies at the intersections of sculpture, architecture, live performance and installation. With an open approach to collaboration, the members of UVA come from backgrounds in a wide variety of disciplines, and this cross-pollination of skills inspires new fields of exploration. Works of them has been exhibited in many art spaces and museums around the globe.